The National Postal Museum Library is one of the largest and most important research facilities for the study of philately and the history of postal services in the world. The National Postal Museum and its Library opened in July 1993, and the National Philatelic Collection and related materials from the National Museum of American History comprise the main body of its core collections. The National Postal Museum Library contains extensive runs of major American philatelic journals and major subject-oriented journals published elsewhere. The collection of monographs on philately and postal history is nearly complete, with emphasis on materials in the English language and those of special importance. 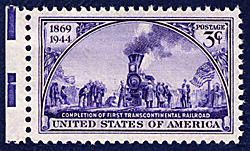 Although the National Postal Museum Library focuses mainly on philately and postal service in the United States, the collections are international in scope. In particular, Canada, Great Britain, Germany and France are well represented. With more than 5,000 books, 6,000 serial titles, manuscript files, photographs and many auction and priced catalogues, the collection also includes major holdings, including files from the United States Post Office, the Highway Post Office, the Aerial Mail Service, the Railway Mail Service, and the Panama Canal Zone Post Office. Frederick J. Melville – Great Britain’s greatest writer, editor and publisher of philatelic literature from the 1890s to the 1940s. Acquired originally by the Library of Congress in 1947, large portions were transferred to the Smithsonian Institution in the 1950s. “Philatelic incunabula” – so-called by philatelic bibliophiles, published during the pioneer period of philately (1861 – 1879). This is one of the most complete collections of this material in the world (ex-Turner and Melville). Melville Books – a complete collection of all the recorded publications of F.J. Melville, with special editions, addenda and related items (ex-Turner and Melville). J.W. Scott Pricelists – in 1867, Scott published his first catalogs as one-page pricelists, and they evolved into the Scott Catalog, which continues to this day. The NPM Library holds pricelists No. 3 (the earliest known Scott catalog), 7 and 11. The Frank A. Bellamy inter-leaved copy of The Catalogue of the Earl of Crawford’s Library. Marginal notes and inter-leaved pages record the library of Frank A. Bellamy, one of the most extensive philatelic libraries in Great Britain. Oscar Berger-Levrault’s [List of stamps] (1861) – the first philatelic publication, one of four copies known, all are in museums. Edward H. Mason’s Essays for United States postage stamps – one of the ten inter-leaved copies used by Mason, that contains photographs of items in his collection. William R. Rickett’s Philatelic literature bibliography index – a complete copy of the privately published index (401 pages) and only three complete copies are acknowledged. C. Schmidt’s Die Postwertzeichen der Russichen Landschaftsaemter (2 vols.) A typed edition, with photographs inserted in the text. Otto Friedl’s Sizilien Platten – a complete set (in photographic reproduction) of plating studies for the Sicilian “Bomba Heads” in the collection of Baron Alphonse de Rothschild. A. M. Tracy Woodward’s Postage stamps of Japan and Dependencies (1928) – one of philately’s rarest books. The library has two copies–one a regular edition, the other a reviewer’s copy. John K. Tiffany’s Philatelical library, a catalogue of stamp publications (1874) – a bibliography of the earliest publications on philately. John K. Tiffany’s Philatelical Index – Part I (1880) – a unique publication indexing passages in all stamp journals referring to U.S. postage stamps. Charles H. Coster’s The United States locals and their history (1877) – the first major work on the private local posts in the United States. John Wilson’s The Royal Philatelic Collection (1952) – the library holds both an original edition and sectional editions. E.D. Bacon’s Catalogue of the Philatelic Library of the Earl of Crawford, K.T. (1911) – an original edition with supplement and addenda; the 1991 reprint of the Bacon copy from the British Library with shelf marks and marginalia. The work of Jean de Sperati (1955) – prepared by the British Philatelic Association, a volume of plates illustrates forged stamps and postmarks created by this master forger. Letter copy books of Butler and Carpenter, important security engravers and printers of U.S. postage stamps, revenue stamps and especially private-die proprietary stamps – a typewritten transcription in 19 volumes (ex-Turner) of the original correspondence, formerly in the collection of Hiram E. Deats. Edward S. Knapp Collection – a special set of ten volumes of photographs of one of the most important collections of philatelic Americana, given to the Smithsonian Institution in 1941 by the Philatelic Research Laboratories, Inc. The original collection was broken up and sold at auction in 1941 – 1942. The National Postal Museum Library has a large collection of stamp auction catalogues, especially of U.S. and London houses, from the 1920’s to date. A special collection of “name” auction sales is housed separately. Sales of particular importance are catalogued and shelved among the monographs. The library has extensive runs of the most popular catalogs (i.e. Scott, Minkus, Stanley Gibbons, Yvert & Tellier) and numerous specialized catalogs. Post Office Department files of the Third Assistant Postmaster General, including original letters sent to various post office officials and replies discussing stamp issues and related postal subjects. Especially strong from 1920 to 1970, the files are organized by Scott number and subject. Other Post Office Department publications – press releases, reports of Postmasters General and other post office officials, documents concerning National Airmail Week (1938), records concerning the development of the zip code system, etc. George T. Turner – original index cards indexing philatelic journals from the U.S., Canada, Great Britain and the colonies. Used in the update of Chester M. Smith’s “List of philatelic journals” (unpublished), the original cards have additional information about the journals, their editors and publishers. George T. Turner – card catalog of the George T. Turner’s philatelic library. It was the most complete private philatelic library ever assembled, and the catalog contains important notes about various publications. Ralph Kimble – a subject index to articles appearing in major philatelic journals from 1935 to 1950. Several index portions were published in the American Philatelist. Stamp Advisory Committee of the U.S. Post Office Department – working papers, letters and other documents created and used by the Stamp Advisory Committee from 1957 to 1967.